Tattoos are no longer just a fashion trend for the gothics or rock singers. Today, tattoos have become a fashion trend for all. Men and women both tattoo their body parts to exhibit their beliefs, values, or ethics. Tattoos have now become a means to portray one’s feelings towards anything and everything, be it a person or a particular religion. There are intricate tattoo designs that men and women ink on their body. For women there are numerous tattoo options, especially with respect to choosing the body parts for inking a tattoo. Ankle tattoos are quite popular amongst women and what’s more they look attractive and gorgeous too. Here are discussed some of the most gorgeous tattoo designs used by women on their ankles. Ankle is the most delicate and bold part of your body to get tattooed. Ankle tattoo designs can be as simple as a small heart to complex and intricate designs such as an ornamental tattoo. You have great many options when wanting to choose a tattoo for your ankles. As mentioned above, a simple heart border tattoo looks quite elegant and gorgeous on your ankles. There are many heart tattoos for women which are more complicated than just this. There are tattoo designs in the form of anklets with heart inked as a pendant on the anklet. A simple anklet with a string of hearts is also a popular tattoo design used by women. An elegant ornamental design surrounding a heart is also a beautiful tattoo design you can think of for your ankles. If we continue on the theme of love, Valentine’s Day having just passed, you can also have the word love tattooed on your ankle. You can also have the name of your partner or husband for your ankle tattoos. Floral patterns are a favorite and popular no matter what you are wearing and tattoos are no exception. There are many beautiful floral ankle tattoo designs that you can get inked on your ankles. Intricate floral patterns to simple floral designs such as a single rose pattern, there are a wide variety of options you have. You can also have colorful floral tattoos inked or tattoos that give a 3D effect on your ankles. Again, there are anklet patterns with floral designs that you can choose for your ankles. Paw prints are also intriguing and cute tattoos for women to ink on their ankles. 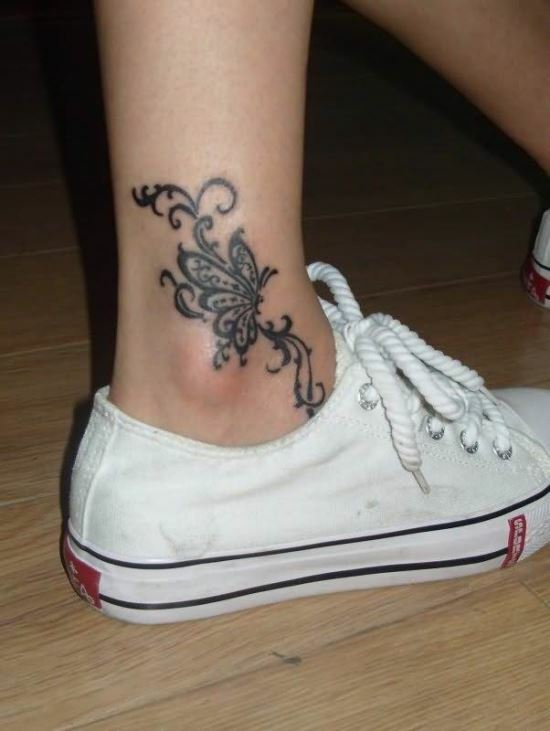 Other fauna tattoo designs that you can use on your ankles are butterflies or intricate feather patterns on the ankles. There are many other ankle tattoos you can choose from. Patterns of stars look quite pretty on your ankles. Ornamental patterns also look pretty on the ankles, giving them quite an attractive look. Other tattoos for women to be inked on ankles are tribal tattoos. There are small tribal or ornamental tattoo designs that you can choose from. Chinese quotes, anchors, or initials are some other patterns you can use on your ankles.